The flavor in this vegetable stew comes from frying the whole spices in hot oil before adding the tomatoes. Serve this hearty dish as a vegetarian main course with rice and a green vegetable, or as a side dish with grilled chicken or meat. 1. Add the canola oil to the karahi, a large skillet, a wok, or a Dutch oven and heat over medium heat. When the oil is hot, add the cashews and fry for 30 seconds, or until lightly browned. Use a slotted spoon or skimmer to transfer the nuts to a plate. Add the cumin and mustard seeds to the oil and fry for 30 seconds, or until lightly browned. Add the onion and ginger and cook, stirring, for 3 to 5 minutes, or until the onion is golden. 2. Add the tomatoes and chile, increase the heat to medium-high, and bring to a boil. Cook, stirring, for 5 minutes, or until slightly reduced and the oil begins to separate from the tomatoes. Add the cauliflower, sweet potatoes, water, and salt, and stir with a large spoon until thoroughly blended. Decrease the heat to mediumlow, cover, and cook, stirring once halfway through the cooking time, for 15 minutes, or until the vegetables are almost tender. Add the peas, re-cover, and cook for 3 minutes, or until all the vegetables are tender. 3. 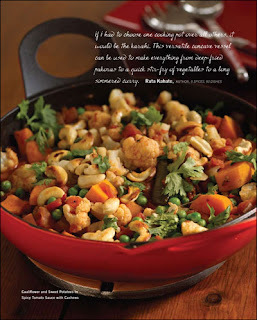 Transfer to a warmed platter or bowl and sprinkle with the reserved cashews and the cilantro. Serve warm.